The benchmark First and Second Editions of Comparing Democracies represented essential guides to the global study of elections. Reflecting recent developments in the field, this timely new edition gives an indispensable state-of-the art review of the whole field from the world’s leading international scholars. 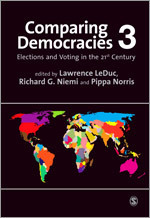 With a completely new thematic introduction which explores how democracy is built and sustained, thoroughly updated chapters (many of which are also new) , the Third Edition provides a theoretical and comparative understanding of the major topics related to elections and introduces important work on key new areas. Comparing Democracies, Third Edition will remain a must-read for students and lecturers of elections and voting behavior, comparative politics, parties, and democracy.